Seattle has a reputation for rainy weather. And it sure is living up to its notoriety this year. Since the weather outside is frightful, why not join inside at Pacific Place? There’s loads to do over the holiday season. Since you’ve no place to go outside, join us. Rainy days are the perfect time for for dinner and movie. Why not visit us this week at Pacific Place? Thai Ginger has some holiday dishes that are sure to delight. And, AMC has a whole slew of movies to choose from. Here’s the deets! 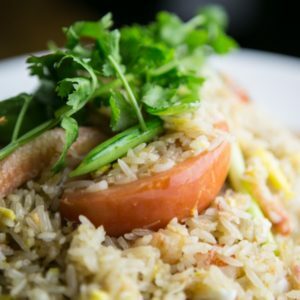 Thai Ginger is well known for our Crab Fried Rice. It’s stir-fried Thai jasmine white rice with fresh Red Rock crab legs and claw meat, as well as snow peas, onions, tomatoes and egg. It’s perfect with a squeeze of lime! Looking for a little adventure? The Tearless Tiger won’t disappoint. 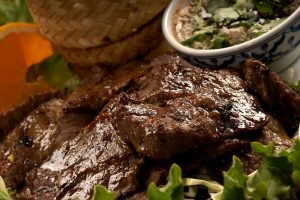 We grill New York Steak marinated Thai-style and serve it with fresh house made chili-lime dipping sauce and sticky rice. This dish is great for Vegans and Vegetarians alike. 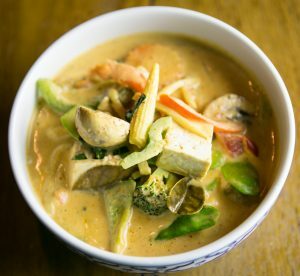 This delicious dish has loads of coconut milk with Green Curry, eggplant, bell peppers and sweet basil. Tofu is an awesome addition. Special Events and Openings later this month – get the details.